Experience the Ozark community's relaxed, modern-day lifestyle and friendly people on this ten day tour through the Ozark country. The rugged beauty and fascinating natural wonders of the Ozark Mountain Region provide visitors with an exciting and inspiring array of things to do. Stunning autumn views of sparkling mountain rivers, clear-water lakes, and spectacular mountains are a stunning backdrop for your vacation fun. We will visit Memphis to see how the King of Rock & Roll lived; Arkansas to learn the customs of the mountain folk; Branson for entertaining shows and then visit the Derby Museum at Churchill Downs. We recommend optional Travel Insurance for this tour. Please ask for a brochure. Touring southward through the lovely Shenandoah Valley will bring us to our lodging for the evening in Virginia. The Tennessee country will provide the scenery enroute to Nashville and our home for the evening. We will tour the famous Opryland Hotel before checking-in to our evening traditional accommodations at the Gaylord Opryland Hotel. Later, we will depart for the Nashville Nightlife Theater for dinner and entertainment. Our morning adventure will be a visit to Loretta Lynn's Ranch, with museum and plantation home tour along with a simulated coal mine tour. This afternoon we will tour Graceland, home of Elvis Presley. Lodging this evening will be at the Drury Inn. Crossing the mighty Mississippi River, the fertile flat lands, and then winding through the Ozark Mountains with its beautiful foliage, will bring us to Mountain View, Arkansas, and the Ozark Folk Center. Watch authentic craftspeople at work and listen to the music, history and customs of a still existing mountain folk. Departing the Ozark Folk Center by mid-afternoon we will travel to Eureka Springs, Arkansas where we will check-in to our lodging and get dinner before attending the Great Passion Play, the live reenactment of the life, death, resurrection and ascension of Jesus Christ by a cast of 200. After checking-out of our hotel, we will visit Christ of the Ozarks, a seven story statue whose outspread arms, measuring 65 feet across, give the appearance of a mammoth cross. We'll depart for Branson for lunch on our own before attending The Duttons Matinee, as well as an evening performance of the Six Show. Favored by its location on Table Rock Lake and Lake Taneycomo, Branson is one of Missouri's largest resort areas. This morning we will visit Silver Dollar City, a replica of an Ozark Pioneer Settlement where more than 30 traditional crafts are demonstrated and country entertainment is featured. (A craft festival is held at Silver Dollar City each year throughout October.) Dinner and show will be aboard the Showboat Branson Belle followed by the Pierce Arrow evening show. This morning we will attend one of the popular morning shows in Branson, The Brett Family. This afternoon we will tour the Titanic Museum. Dinner will be at McFarlain's Family Restaurant followed by The Shoji Tabuchi Theater. Today we will visit the lovely restored waterfront area of St. Louis, the Gateway to the West. We enjoy a guided tour of St. Louis before continuing on to our lodging in Mount Vernon, Illinois. 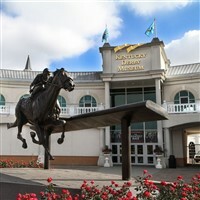 This afternoon we will experience the thrill of the Kentucky Derby at Churchill Downs when we have a tour (weather permitting) plus visit the Derby Museum housing three floors of derby displays and memorabilia. Our lodging this evening will be in Dublin, Ohio. Today, our arrival home will be early evening.